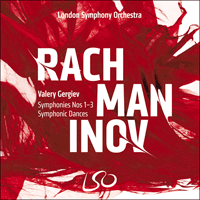 A new collection bringing together Valery Gergiev’s acclaimed cycle of the complete Rachmaninov symphonies with the London Symphony Orchestra. Also included are the Symphonic Dances and two symphonic poems by Mili Balakirev. ’Melody is music,’ wrote Rachmaninov, ’the basis of music as a whole, since a perfect melody implies and calls into being its own harmonic design.’ The Russian composer, pianist and conductor’s passion for melody was central to his work, clearly heard in his Rhapsody on a theme of Paganini, a brilliant and diverse set of variations on a tune by the great 19th-century violinist and composer Nicolò Paganini. Although the young Sergei’s father squandered much of the family inheritance, initially he invested wisely in his son’s musical education. In 1882 the boy received a scholarship to study at the St Petersburg Conservatory, but further disasters at home hindered his progress and he moved to study at the Moscow Conservatory. Here he proved an outstanding piano pupil and began to study composition. Rachmaninov’s early works reveal his debt to the music of Rimsky-Korsakov and Tchaikovsky, although he rapidly forged a personal, richly lyrical musical language, clearly expressed in his Prelude in C sharp minor for piano (1892). His First Symphony (1897) was savaged by the critics, which caused the composer’s confidence to evaporate. In desperation he sought help from Dr Nikolai Dahl, whose hypnotherapy sessions restored Rachmaninov’s self-belief and gave him the will to complete his Second Piano Concerto, widely known through its later use as the soundtrack for the classic film Brief Encounter. Thereafter, his creative imagination ran free to produce a string of unashamedly romantic works divorced from newer musical trends. He left Russia shortly before the October Revolution in 1917, touring as pianist and conductor and buying properties in Europe and the USA. Rachmaninov’s star shone brightly at the beginning of his career. He was barely twenty when his one-act opera Aleko, composed as a graduation exercise from the Moscow Conservatory, was praised by Tchaikovsky and performed at the Bolshoi. He had also already composed his First Piano Concerto. Following two smaller-scale orchestral pieces, The Rock and the Fantasy on Gypsy Themes, he felt ready to tackle the most demanding orchestral form. He devoted most of 1895 to composing his enormously ambitious First Symphony, a work that would surpass everything he had yet achieved. ‘I believed I had opened up entirely new paths’, he recalled many years later. At various times Rachmaninov thought of revising the symphony, but when he emigrated in 1918 the score was left behind in Russia and subsequently disappeared. It was only in 1944 that the original orchestral parts were rediscovered, allowing the symphony to be reconstructed and performed in Moscow on 17 October 1945. Two things became clear when the symphony was brought back to life: that this was the boldest and most interesting Russian symphony in the decade after Tchaikovsky’s 'Pathétique', and that its hostile reception changed the course of Rachmaninov’s composition, for he never again allowed himself the expression of such raw passion and such blatantly tragic gestures. At the centre of the Symphony lies a single two-in-one movement combining slow movement and scherzo. This movement, like the first, opens and closes with the motto theme. The Adagio represents Rachmaninov at his most succulent, with a controlled flow of expressive melody rising by degrees to an impassioned climax. The Allegro vivace, in complete contrast, is brittle, quirky, full of unexpected twists and bizarre orchestral sonorities. When it has run its course, the Adagio returns, but as a tenuous memory of itself. Much abbreviated, it cannot rise to its former level of intensity but gently fades away in a retrospective haze. The central movements can be heard as a sort of pivot around which the symphony turns, and it is the toughness introduced by the scherzo section which nourishes the finale: in other words, it is as though images of the past must now give way to an acceptance of the present, with all its contradictions and unsolved challenges. The finale is, in some ways, the most straightforward movement of the three, with its sharp rhythmic impetus and orchestral virtuosity. But passing reminiscences of earlier themes, as well as those fleeting references to the Dies irae, cast disturbing shadows across its features. Did Rachmaninov realise that the Symphonic Dances would be his last work? Whether he had such a premonition or not, few composers have ended their careers with such appropriate music, for the Symphonic Dances contain all that is finest in Rachmaninov, representing a compendium of a lifetime’s musical and emotional experience. The work’s composition was preceded by a big public retrospective of his triple career as composer, pianist and conductor. On 11 August 1939 Rachmaninov gave his last performance in Europe and shortly afterwards left with his family for the US, one of many artists driven from Europe by the approach of war. In the following winter season the Philadelphia Orchestra gave five all-Rachmaninov concerts in New York to mark the 30th anniversary of his American debut (in 1909 he had premièred his Third Piano Concerto in New York, first with Walter Damrosch and then with Gustav Mahler conducting). Rachmaninov appeared as pianist and conductor; the works played included the first three piano concertos, the Rhapsody on a theme of Paganini, the Second and Third Symphonies, the symphonic poem The Isle of the Dead and the choral symphony The Bells. In the summer of 1941 he wrote to Eugene Ormandy offering him and the Philadelphia Orchestra the first performance of three ’Fantastic Dances’; when the orchestration was completed two months later, the title had been finalised as ’Symphonic Dances’. The work exists in two versions: for large orchestra, and for two pianos. Rachmaninov, although an expert orchestrator, was always anxious to have the bowings and articulations of the string parts checked by a professional player, and in this case he enjoyed the assistance of no less a violinist than Fritz Kreisler. Rachmaninov was usually reluctant to talk about his music, and so we know almost nothing about the background to the composition of the Symphonic Dances. We do know that other of his works owe their existence to some visual or literary stimulus—The Isle of the Dead, for example, or several of the Études-tableaux for solo piano—and it is highly likely that the composer invested the Symphonic Dances with a poetic and even autobiographical significance which we can guess at, but which he never divulged. One clue is perhaps provided by the titles which he suggested for each movement. Since Mikhail Fokine had devised a successful ballet using the score of the Rhapsody on a theme of Paganini (Covent Garden, London, 1939), a further collaboration was now suggested. Rachmaninov played the Symphonic Dances to the choreographer, and explained that they followed the sequence Midday – Twilight – Midnight. The first dance is a three-part structure, with fast outer sections in C minor enclosing a slower episode in C sharp minor. It is marked by an extraordinary, and at times even eccentric, use of the orchestra. After the stamping opening section, with its use of the piano as an orchestral instrument and piercingly strident woodwind calls, the central section offers gently undulating woodwind lines against which appears a great Rachmaninov melody, given at first to a solo alto saxophone—an eerie, melancholy sound, unique in his music. Towards the end of this first dance calm spreads over the music, and with a change from C minor to C major comes a broad new theme in the strings against a chiming decoration of flute, piccolo, piano, harp and bells. Rachmaninov would not have expected this to be recognised as a self-quotation, for it is the motto theme of his ill-fated First Symphony, withdrawn (and the score apparently lost) after its disastrous first and only performance in 1897. The failure of this work had been a crippling blow to the young composer, who for some years afterwards had been incapable of further composition. There is no knowing what private significance this quotation now had for Rachmaninov at the end of his life. Was it an exorcism, perhaps, or a recollection of the early love affair that had lain behind the Symphony? A snarl from the brass opens the second of the dances. This is a symphonic waltz in the tradition of Berlioz, Tchaikovsky and Mahler; and as in movements by those composers, the waltz, that most social and sociable of dances, at times takes on the character of a danse macabre. The title ’Twilight’ is perfectly suited to this shadowy music, haunted by spectres of the past. The first four notes of the motto theme from the First Symphony quoted in the first dance have a further significance which reveals itself in the third dance: they form the first notes of the Dies irae plainchant, that spectre of death which haunts so much of Rachmaninov’s music. This third dance is, like the first, in a three-part structure. The central section is imbued with a lingering, fatalistic chromaticism; the outer sections, by contrast, contain some of the most dynamic music Rachmaninov ever wrote. Another significant self-quotation is the appearance of a chant from the Russian Orthodox liturgy, which Rachmaninov had set in his 1915 All-Night Vigil (usually referred to as the Vespers). This chant and the Dies irae engage in what is virtually a life-against-death struggle; and towards the end, at the point where the Dies irae is finally overcome and vanquished by a new liturgical chant, Rachmaninov wrote in the score the word ’Alliluya’ (Rachmaninov’s spelling, in Latin, not Cyrillic, characters). At the end of his life, then, and with the last music he composed, Rachmaninov seems finally to have exorcised the ghost that stalks through all his music, summed up in the phrase by Pushkin that he had set nearly half a century earlier in his opera Aleko: ’Against fate there is no protection’. The first performance was given on 3 January 1942 by the Philadelphia Orchestra under Eugene Ormandy. The work received a mixed reception, much as the Third Symphony had done five years before. Apart from the hardly relevant question of whether the musical language was too old-fashioned or not, what seems to have confused everyone at the time was an elusive quality to the work, an uncomfortable ambiguity of aims and expression. With the passage of time the Symphonic Dances have gradually come to be recognised as one of Rachmaninov’s finest achievements, where the high level of invention and the orchestral brilliance are only further enhanced by a deep sense of mystery that lies at the heart of the work. Mily Balakirev grew up down the Volga river from Moscow, in the provincial city of Nizhny Novgorod. But it was St Petersburg that beckoned, and the young Balakirev’s musical ambitions drove him to abandon his mathematical studies and pursue the artistic life in Russia’s cultural capital. His decision was quickly validated and the young composer rose to prominence in the city’s thriving intellectual community, eventually becoming part of a group known as 'The Five'. Together with Alexander Borodin, César Cui, Modest Mussorgsky, and Nikolai Rimsky-Korsakov, these young musicians rallied against the bourgeois musical establishment, championing the untempered creative spirit of the autodidact and the inherent value of Russia’s rich folk culture. Because of his experience Balakirev took on the unofficial role of mentor to the group but became somewhat of an authoritarian. He would reject outright any musical opinion that differed from his own, which led to all of the Five’s music sounding increasingly similar and more like his own. These personal insecurities, magnified in a personality prone to bouts of intense depression, led to a nervous breakdown in 1871, when Balakirev abandoned all aspects of his musical life to find solace in the Russian Orthodox Church. He also resigned from the directorship of the Free Music School in St Petersburg and found a comfortable position as a railway clerk away from the city. By this point he had stopped composing altogether. He eventually returned five years later to resume his duties as director and began to write music in a style similar to his younger days, but tragically lacking in passion. He retired in 1895 and devoted his remaining years to composition. Balakirev first visited the Caucasus in 1862 and was thrilled by the dramatic landscapes, the people and their music. One result of this visit was Islamey, the fiendishly difficult ‘oriental fantasy’ for piano that he composed in autumn of 1869. Then came Tamara, the symphonic poem eventually completed only in 1882, and which is often considered his masterpiece. Tamara takes its title from a poem by Mikhail Lermontov (1814-1841) describing a deep gorge in northern Georgia through which flows the river Terek. Overlooking the gorge is a high tower in which lives the princess Tamara, ‘as beautiful as a heavenly angel, as evil and cunning as a demon’. A passing traveller is drawn to this tower as if by a spell, and is there welcomed by Tamara, dressed in brocade and pearls and lying on a soft couch. ‘Strange, wild sounds echoed throughout the night’, and it seemed that within Tamara’s tower ‘a hundred passionate youths and girls had come together on their wedding night to the sounds of wailing at a sumptuous funeral’. But as the first light of dawn comes over the mountains, an eerie silence falls. The river rushes on, seeming to weep as a corpse is carried along by its waters. From a window of the tower there is a flutter of white and a whispered farewell, ‘such a tender farewell, the voice was so sweet, it seemed to promise an ecstatic meeting, a loving caress’. The oriental style pioneered by Glinka in his opera Ruslan and Lyudmila, and then developed to a high level by Balakirev and his followers, featured two main elements: a sinuous type of slow melody, often heavily ornamented and with augmented intervals, and fast dance measures with much repetition, often accompanied by lavish percussion. In Tamara these features are essential to illustrating the atmosphere and narrative course of the poem. The opening is nature painting, evoking the river gorge; from this there gradually emerges the first of Tamara’s themes on rising woodwind. There is a feeling of gathering doom as further themes add detail and colour to the narrative. The syncopations and rhythmic dislocations, the sheer frenzy, even hysteria, of some passages, are as disturbing as they are exciting. «La mélodie, c’est la musique», écrivit Rachmaninov, «c’est la base de la musique tout entière, car une mélodie parfaite implique et fait surgir son propre schéma harmonique.» La passion du compositeur, pianiste et chef d’orchestre russe pour la mélodie fut capitale pour son œuvre, comme en témoigne à l’évidence sa Rhapsodie sur un thème de Paganini, série de variations pleines de brio et de diversité sur un air du grand violoniste et compositeur du XIXe siècle Niccolò Paganini. Bien que le père du jeune Sergueï ait dilapidé une bonne part de l’héritage familial, il eut au commencement la sagesse d’investir sur l’éducation musicale de son fils. En 1882, le jeune garçon obtint une bourse pour aller étudier au conservatoire de Saint-Pétersbourg, mais de nouvelles catastrophes familiales mirent un frein à ses progrès et il déménagea afin de poursuivre son apprentissage au conservatoire de Moscou. Il s’y révéla comme un élève de piano très doué et y commença l’étude de la composition. Les premières œuvres de Rachmaninov révèlent sa dette à l’égard de la musique de Rimski-Korsakov et Tchaïkovski, même s’il s’est rapidement forgé un langage musical personnel, éminemment lyrique, qui s’exprime avec évidence dans le Prélude pour piano en ut dièse mineur (1892). Sa Première Symphonie (1897) fut éreintée par la critique, ce qui anéantit son assurance. Dans son désespoir, le compositeur chercha secours auprès du Dr Nikolaï Dahl, qui par des séances d’hypnose rétablit sa confiance en lui-même et suscita sa volonté de composer le Deuxième Concerto pour piano, appelé à une célébrité planétaire par son apparition ultérieure dans la bande-son de Brève Rencontre, un classique du cinéma. Par la suite, l’imagination créatrice de Rachmaninov se déploya sans ambages dans une succession d’œuvres délibérément romantiques, qui tournaient le dos aux courants musicaux les plus modernes. Il quitta la Russie peu avant la révolution d’Octobre en 1917, donnant des concerts comme pianiste et chef d’orchestre et achetant des propriétés en Europe et aux Etats-Unis. Belaïev accepta de donner l’œuvre dans le cadre des Concerts symphoniques russes à Saint-Pétersbourg, série de concerts qu’il avait créée et dont il était le mécène et qui, sous la direction conjointe de Rimski-Korsakov et Glazounov, se consacrait à la promotion de la nouvelle musique russe. Peut-être Rachmaninov aurait-il mieux fait de faire jouer sa symphonie à Moscou, où il était plus connu, mais certainement fut-il séduit à l’idée du prestige que représentait une création à Saint-Pétersbourg, où Glazounov avait déjà dirigé une exécution du Rocher. À plusieurs reprises, Rachmaninov envisagea de réviser la symphonie mais, lorsqu’il émigra en 1918, il laissa derrière lui la partition, qui par la suite fut égarée. Le matériel d’orchestre original ne fut retrouvé qu’en 1944, rendant possible la reconstitution de la symphonie et son exécution à Moscou le 17 octobre 1945. Deux éléments apparurent clairement lorsque la partition fut rendue à la vie: d’une part, qu’il s’agissait de la symphonie russe la plus hardie et la plus intéressante dans la décennie suivant la «Pathétique» de Tchaïkovski et, d’autre part, que sa réception hostile avait changé le cours de la carrière de compositeur de Rachmaninov, qui ne s’était plus jamais autorisé l’expression d’une passion aussi brute et d’élans aussi ouvertement tragiques. À l’instar de Tchaïkovski, Rachmaninov crée le drame en confrontant deux groupes thématiques aux caractères très tranchés, mais assure également l’unité de la symphonie par une forme cyclique et des références thématiques croisées entre les mouvements, toujours clairement perceptibles. Chaque mouvement débute par la même figure de quatre notes. Dans le premier mouvement, ce motif est suivi immédiatement par une figure descendante menaçante aux cordes graves. Il s’agit du motif cyclique de la symphonie, que l’on retrouve sous diverses transformations dans nombre de thèmes ultérieurs. D’un bout à l’autre, la symphonie déploie un contraste saisissant entre des thèmes au caractère presque liturgique et d’autres présentant des inflexions tsiganes. On a interprété cette polarité comme le reflet d’un drame personnel vécu par Rachmaninov. La partition est dédiée «à A. L.» et porte cette sinistre citation de saint Paul, «La vengeance est mienne, je me vengerai». Cette phrase est également placée en exergue d’Anna Karénine de Tolstoï, histoire d’une femme passionnée poussée à la destruction. «A. L.» est très certainement Anna Lodijenskaïa, l’épouse d’un ami, qui avait du sang tsigane; on ne sait rien avec certitude quant aux relations que Rachmaninov entretenait avec cette femme, et leur histoire reste nimbée de mystère. Mais nous savons une chose: dans sa dernière œuvre, les Danses symphoniques, Rachmaninov rappelle le thème cyclique de sa Première Symphonie dans un chatoiement doré de sons: quelle que soit l’expérience personnelle que cache la symphonie, elle était toujours très présente à l’esprit du compositeur à la fin de sa vie. Après les représentations des ses opéras en un acte Le Chevalier avare et Francesca da Rimini, en janvier 1906, Rachmaninov s’attela à la composition d’un opéra sur Monna Vanna de Maeterlinck, mais cet ouvrage rencontra des difficultés et resta à l’état de fragment. Puis, en février 1907, le compositeur écrivit à un ami à propos d’une rumeur qui circulait dans la presse russe: «C’est vrai, j’ai composé une symphonie. Elle est pourtant à l’état brut. Je l’ai terminée il y a un mois et immédiatement mise de côté. Elle a été pour moi une grande source de tracas, et je ne veux plus y penser. Mais le fait que les journaux aient eu connaissance de son existence me laisse perplexe.» Rachmaninov avait toutes les raisons de se montrer prudent dans l’annonce d’une nouvelle symphonie, car l’unique exécution de la Première, en 1897, avait été un désastre. L’Allegro moderato en mi mineur découle de l’introduction de manière organique. Son premier thème ardent est porté en avant avec les mêmes techniques séquentielles que celles qui caractérisaient l’introduction, mais le tempo plus élevé donne à la musique un caractère plus positif, plus tenace. Le second thème, qui débute et se termine en sol majeur, n’est pas conçu pour contraster fortement avec le premier, mais plutôt pour prolonger son discours mélodique dans des coloris différents, plus légers. Le turbulent développement, qui fragmente des motifs de l’introduction et le premier thème, se déverse dans la reprise du premier thème, lequel conduit au sommet le plus intense du mouvement, écho du passage dépeignant le tourbillon infernal dans Francesca da Rimini. Le retour du second thème marque la première apparition de mi majeur, suggérant une conclusion dans la tonalité majeure; mais, tandis que le tempo s’accélère pour la coda, la musique s’assombrit et le mouvement se clot dans un mi mineur tempétueux. Rachmaninov avait raison quant à la qualité de sa symphonie; mais peut-être faut-il pardonner aux premiers auditeurs, dans des États-Unis qui souffraient encore de la Dépression et dans une Europe craignant la guerre, de ne pas avoir apprécié dès la première écoute l’originalité de la partition. Composée dans un exil forcé, la Troisième Symphonie est à cheval inconfortablement entre deux mondes: la Russie, que Rachmaninov avait quittée après la révolution, et un nouvel environnement incertain, celui de l’Europe de l’Ouest et des Etats-Unis de l’entre-deux-guerres, dans lequel il fut contraint de reconstruire sa vie. La plupart des thèmes de la symphonie ont un caractère russe appuyé, mais ils sont traités avec une telle ambiguïté que peu d’éléments se révèlent conformes à qu’ils semblaient être de prime abord. Ainsi en est-il, par exemple, de ce que l’on désigne généralement comme le «thème-devise». Ce thème, une oscillation de trois notes dans l’esprit d’une psalmodie, apparaît au tout début, dans les couleurs pâles, étouffées de la clarinette, du cor avec sourdine et du violoncelle solo dans l’aigu. Il revient sous diverses formes au cours de la symphonie, mais c’est seulement à mi-parcours du finale qu’émerge sa signification latente. Furtivement, dans des passages que l’on remarque à peine, il sonne clairement comme une variante du Dies irae grégorien—cette signature mélodique qui hante toute la musique de Rachmaninov, comme un sinistre rappel de la mortalité. Le mouvement central de la symphonie mixe mouvement lent et scherzo. Comme le premier mouvement, il s’ouvre et se referme par le thème-devise. L’Adagio montre Rachmaninov sous son jour le plus séduisant, avec un flot contrôlé de mélodies expressives progressant peu à peu jusqu’à un sommet fiévreux. L’Allegro vivace, dans un effet de contraste total, est mordant, surprenant, plein de rebondissements inattendus et de sonorités orchestrales étranges. À la fin de cette section, l’Adagio fait son retour, mais comme le souvenir ténu de lui-même. Très écourté, il n’est pas en mesure d’atteindre son précédent niveau d’intensité mais s’éteint doucement dans un halo de souvenirs. Rachmaninov avait-il conscience que les Danses symphoniques seraient sa dernière œuvre? Qu’il en ait eu la prémonition ou non, il a offert à sa carrière une conclusion appropriée comme peu de compositeurs l’ont fait: les Danses symphoniques comptent parmi ce que Rachmaninov a écrit de plus beau, représentant le bilan d’une vie entière de musique et d’émotions. La composition de cette partition fut précédée par un grand hommage public à la triple carrière du musicien comme compositeur, pianiste et chef d’orchestre. Le 11 août 1939, Rachmaninov donna son dernier concert en Europe, et peut après il partit avec sa famille pour les États-Unis, comme tant d’artistes poussés hors du Vieux Continent par l’imminence de la guerre. Au cours de l’hiver suivant, l’Orchestre de Philadelphie lui consacra cinq concerts afin de marquer le trentième anniversaire de ses débuts américains (en 1909, il avait créé son Troisième Concerto pour piano à New York, tout d’abord sous la direction de Walter Damrosch, puis sous celle de Gustav Mahler). Rachmaninov se produisit comme pianiste et comme chef et, parmi les œuvres jouées, figuraient les trois premiers concertos pour piano, la Rhapsodie sur un thème de Paganini, les Deuxième et Troisième Symphonies, le poème symphonique L’Île des morts et la symphonie chorale Les Cloches. Au cours de l’été 1941, Rachmaninov écrivit à Eugene Ormandy et lui offrit, ainsi qu’à l’Orchestre de Philadelphie, la création de trois Danses fantastiques; lorsque l’orchestration fut achevée deux mois plus tard, l’œuvre avait trouvé son titre définitif de Danses symphoniques. La partition existe sous deux formes: pour grand orchestre, et pour deux pianos. Rachmaninov, bien qu’expert en matière d’orchestration, veillait toujours anxieusement à faire contrôler les coups d’archet et les phrasés des parties de cordes par un instrumentiste professionnel et, en l’occurrence, le violoniste qui le fit bénéficier de son aide n’était pas le moindre, puisqu’il s’agissait de Fritz Kreisler. Rachmaninov se montra toujours réticent à s’exprimer sur sa propre musique, si bien que nous ignorons à peu près tout des circonstances de composition des Danses symphoniques. Nous savons que d’autres de ses œuvres naquirent d’un stimulus visuel ou littéraire—L’Île des morts, par exemple, ou plusieurs des Études-tableaux pour piano seul—et il est très vraisemblable que le compositeur ait investi les Danses symphoniques d’une signification poétique, voire autobiographique que nous pouvons tenter de deviner, mais qu’il ne révéla jamais. Les titres qu’il suggéra pour chacun des mouvements offrent peut-être une clef. Depuis que Mikhaïl Fokine avait conçu avec succès un ballet sur la musique de la Rhapsodie sur un thème de Paganini (Covent Garden, Londres, 1939), une nouvelle collaboration était envisagée. Rachmaninov joua les Danses symphoniques au chorégraphe, et lui expliqua qu’elles suivaient le déroulement Midi – Crépuscule – Minuit. La première danse adopte un schéma tripartite, avec deux sections extérieures vives en ut mineur entourant un épisode plus lent en ut dièse mineur. Elle est marquée par une utilisation hors du commun, voire excentrique, de l’orchestre. Après les trépignements des premières mesures, qui recourent au piano comme instrument d’orchestre et font entendre des appels de bois stridents, la section centrale présente des lignes de bois aux douces ondulations sur lesquelles se déploie une de ces mélodies magnifiques dont Rachmaninov avait le secret, tout d’abord au saxophone alto—une phrase étrange, mélancolique, unique dans son œuvre. À la fin de la première danse, le calme envahit la musique et, tandis que l’on passe d’ut mineur en ut majeur, s’élève aux cordes un ample nouveau thème sur les motifs tintinnabulants des flûte, piccolo, piano, harpe et cloches. Rachmaninov ne s’attendait peut-être pas à ce que l’on y reconnaisse une autocitation: il s’agit en effet du thème cyclique de sa malheureuse Première Symphonie, qu’il retira (et dont la partition fut apparemment perdue) après une première—et unique—exécution catastrophique en 1897. L’échec de cette œuvre avait été un coup terrible pour le jeune compositeur, incapable d’écrire quoique ce soit de nouveau pendant plusieurs années. On ignore la signification personnelle que cette citation avait pour Rachmaninov à la fin de sa vie. S’agissait-il d’exorciser quelque chose, ou cela traduisait-il le souvenir de l’histoire d’amour cachée sous la symphonie? Un grondement de cuivres ouvre la deuxième danse. Il s’agit d’une valse symphonique dans la tradition de Berlioz, Tchaïkovski et Mahler; et, comme dans les mouvements de ces compositeurs, la valse, la plus sociale et sociable des danses, prend par endroit l’aspect d’une danse macabre. Le titre de «Crépuscule» convient parfaitement à cette musique traversée d’ombres, hantée par les fantômes du passé. La création eut lieu le 3 janvier 1942 par l’Orchestre de Philadelphie sous la direction d’Eugene Ormandy. L’œuvre reçut un accueil mitigé, tout comme la Troisième Symphonie cinq ans plus tôt. Si l’on met de côté la question, assez secondaire, de savoir si le langage musical était trop désuet ou pas, ce qui semble avoir dérouté tout le monde à l’époque est le caractère insaisissable de l’œuvre, l’ambiguïté dérangeante de ses desseins et de son expression. Avec le temps, les Danses symphoniques ont peu à peu été reconnues comme l’une des plus grandes réussites de Rachmaninov, comme une partition dont l’invention élevée et le brio orchestral n’ont d’égal que le sens profond du mystère qui réside au cœur de l’œuvre. Mili Balakirev grandit au bord de la Volga, en aval de Moscou, dans la ville provinciale de Nijni Novgorod. Mais c’est Saint-Pétersbourg qui l’attira, et les ambitions musicales du jeune Balakirev l’y poussèrent à abandonner ses études de mathématiques et à s’engager dans la vie artistique de la capitale culturelle de la Russie. Cette décision porta bientôt ses fruits, et le jeune compositeur commença à se faire remarquer dans la communauté intellectuelle florissante de la ville, jusqu’à former le groupe dit «des Cinq» avec Alexandre Borodine, César Cui, Modest Moussorgski et Nikolaï Rimski-Korsakov. Ces jeunes musiciens s’élevaient contre l’establishment musical bourgeois, défendant la créativité sans entraves des autodidactes et les valeurs intrinsèques de la riche culture populaire russe. En raison de son expérience, Balakirev devint le mentor officieux du groupe, montrant un certain autoritarisme. Il se mit à rejeter abruptement toute opinion musicale qui différait de celles qu’il défendait, si bien que toute la musique des Cinq se mit à sonner de plus en plus comme la sienne. Ces angoisses personnelles, attisées par une propension aux symptômes dépressifs, aboutirent à une dépression nerveuse en 1871; Balakirev abandonna alors tous les aspects de sa carrière musicale et trouva du réconfort auprès de l’Eglise orthodoxe russe. Il démissionna également de ses fonctions de directeur de l’Ecole de musique libre de Saint-Pétersbourg et obtint un poste confortable d’employé de bureau aux chemins de fer, loin de la ville. À cette époque, il avait complètement cessé de composer. Cinq ans plus tard, il finit par reprendre son poste de directeur. Il recommença à écrire de la musique dans un style proche de celui de ses jeunes années, mais la passion lui faisait cruellement défaut. Il prit sa retraite en 1895 et consacra ses dernières années à la composition. Balakirev séjourna pour la première fois dans le Caucase en 1862 et s’enthousiasma pour les paysages spectaculaires qu’il y découvrit, ainsi que pour les habitants et leur musique. Il en résulta notamment Islamey, la «fantaisie orientale» pour piano d’une redoutable difficulté qu’il composa en automne 1869. Vint ensuite Tamara, poème symphonique qu’il ne devait achever qu’en 1882, que l’on considère souvent comme son chef-d’œuvre. Le titre de Tamara provient d’un poème de Mikhaïl Lermontov (1814-1841) situé au nord de la Géorgie, dans les gorges profondes où coule la rivière Terek. Surplombant ces gorges se dresse une haute tour, dans laquelle vit la princesse Tamara, «aussi belle qu’un ange du ciel, aussi méchante et perfide qu’un démon». Un voyageur de passage est attiré par la tour, comme ensorcelé. Tamara l’y accueille, parée de brocart et de perle, couchée sur un divan moelleux. «Des sons étranges et sauvages retentissent à travers la nuit», et il semble qu’à l’intérieur de la tour de Tamara «une centaine de jeunes gens et de jeunes filles ardents sont réunis pour leur nuit de noces, tandis que s’élèvent les gémissements de somptueuses funérailles». Mais, tandis qu’apparaissent les premières lueurs de l’aube sur les montagnes, un silence sinistre se fait. La rivière gronde; elle semble pleurer lorsque ses flots font dériver un corps. Une fenêtre de la tour s’éclaire d’une lueur, et l’on entend murmurer un adieu, «un si tendre adieu, d’une voix si douce, comme si elle promettait un rendez-vous d’extase, les caresses de l’amour». Le style oriental dont Glinka avait été le pionnier dans son opéra Rousslan et Lioudmila, et que Balakirev et ses disciples avaient porté à un niveau élevé, se caractérise par deux éléments principaux: un type de mélodies lentes et sinueuses, souvent richement ornementées et présentant des intervalles augmentés, et des rythmes de danses rapides avec de nombreuses répétitions, souvent accompagnés d’une percussion luxuriante. Dans Tamara, ces éléments sont essentiels pour brosser l’atmosphère et traduire le déroulement narratif du poème. Le début est une peinture de la nature, évoquant les gorges de la rivière; de là émerge peu à peu le premier des thèmes associés à Tamara, sur des figures ascendantes des bois. On a le sentiment que les destins funestes s’accumulent, tandis que de nouveaux thèmes ajoutent détails et couleurs au récit. Les syncopes et les dislocations du rythme, la pure frénésie, voire l’hystérie de certains passages, sont tout aussi dérangeants qu’ils sont galvanisants. „Melodie ist Musik“, schrieb Rachmaninow, „die Grundlage der Musik als Ganzes, weil eine perfekte Melodie ihre eigene harmonische Gestalt birgt und ins Leben ruft.“ Die Leidenschaft des russischen Komponisten, Pianisten und Dirigenten für Melodien spielte in seinem Schaffen eine zentrale Rolle und ist deutlich hörbar in seiner Rhapsodie über ein Thema von Paganini, einer brillanten und vielseitigen Variationsreihe über ein Thema des großartigen Violinisten und Komponisten des 19. Jahrhunderts Niccolò Paganini. Obwohl der Vater des jungen Sergei den Großteil des Erbes verschwendete, investierte er anfänglich klug in die musikalische Ausbildung seines Sohns. 1882 erhielt der Junge ein Stipendium für ein Studium am St. Petersburger Konservatorium, doch weitere Katastrophen zu Hause hinderten seine Entwicklung. Er zog deshalb nach Moskau und studierte dort weiter. Hier erwies er sich als ein ausgezeichneter Klavierstudent und begann mit Kompositionsunterricht. Rachmaninows frühe Werke zeigen den Einfluss von Rimski-Korsakow und Tschaikowski. Doch bald schon bildete er eine eigene, opulent lyrische Musiksprache heraus, die deutlich in seinem Prélude in cis-Moll für Klavier (1892) zum Ausdruck kommt. Seine 1. Sinfonie (1897) wurde von den Rezensenten zerrissen, was das Selbstwertgefühl des Komponisten total zerrüttete. Verzweifelt bat er Dr. Nikolai Dahl um Hilfe, dessen Hypnotherapie Rachmaninows Glauben an sich selbst wiederherstellte und ihn im Willen stärkte, sein 2. Klavierkonzert abzuschließen, das durch seine spätere Verwendung als Musik zum Filmklassiker Begegnung weithin bekannt wurde. Danach entfaltete sich Rachmaninows Kreativität frei und er schuf eine Reihe von unverhohlen romantischen Werken jenseits neuerer musikalischer Trends. Er verließ Russland kurz vor der Oktoberrevolution 1917, unternahm Konzertreisen als Pianist und Dirigent und erwarb Immobilien in Europa und den USA. Alle wohlwollenden Hörer sind sich einig, dass die 2. Sinfonie das Allerbeste von Rachmaninow enthält. Sie zeichnet sich durch beherrschte Entfaltung und rhythmische Flexibilität aus, wird aber vor allem von der herrlich ergiebigen Melodie, Rachmaninows Paradenummer, vorangetrieben. Der Orchesterklang ist voll und satt, aber im Gegensatz zu solchen Zeitgenossen wie Strauss und Mahler stellt Rachmaninow relativ bescheidene Anforderungen an das Orchester. Er passt mit seiner Orchesterbehandlung auch nicht gerade ins russische Lager. Statt der von so vielen seiner Landsleute (von Glinka bis Schostakowitsch) vorgezogenen ungemischten Farben verwendet Rachmaninow diverse Schattierungen und Kombinationen und schafft so eine dicke, klangvolle Mischung, wobei Hörner und tiefe Holzbläser (besonders die melancholischen Instrumente Englischhorn und Bassklarinette) die Mitte des Orchestersatzes stützen und die Tuba die lang ausgehaltenen und die Musik häufig untermauernden Bassnoten oktavieren. Die langsame Einleitung beginnt mit einer ganzen Gruppe von hintereinander erklingenden Mottothemen: die anfängliche Unisonogeste in den Violoncelli und Kontrabässen, ominöse Blechund Holzbläserakkorde sowie das von den ersten zu den zweiten Violinen gereichte Motiv. Diese Einleitung ist nicht nur eine reiche Quelle an thematischem Material, sondern gibt auch zu verstehen, auf was man sich im Folgenden gefasst zu machen hat. Das Allegro moderato in e-Moll wächst organisch aus der Einleitung heraus. Sein sehnsuchtsvolles erstes Thema wird mit der gleichen Reihungstechnik vorgetragen, die auch die Einleitung kennzeichnete, aber das schnellere Tempo verleiht der Musik einen positiveren, stärker vorwärts strebenden Charakter. Das in G-Dur beginnende und endende zweite Thema erhielt seine Gestalt nicht, um sich von dem ersten stark abzuheben, sondern eher, um die melodische Schilderung in einem anderen und leichter klingenden tonalen Bereich fortzusetzen. Die turbulente Durchführung, die Motive aus der Einleitung und dem ersten Thema fragmentiert, überschneidet sich mit der Reprise des ersten Themas, die ihrerseits zum intensivsten Höhepunkt des Satzes führt mit Anklängen an die Musik, die in Francesca da Rimini den infernalischen Wirbelsturm darstellt. Bei der Rückkehr des zweiten Themas erklingt zum ersten Mal E-Dur, was zur Annahme verführt, der Satz würde in einer Durtonart schließen. Aber wenn das Tempo für die Koda anzieht, trübt sich die Musik wieder ein und endet in einem stürmischen E-Moll. Rachmaninow begann die 3. Sinfonie im Sommer 1935 in seiner Villa am Vierwaldstättersee in der Schweiz. Die ersten zwei Sätze entstanden relativ schnell. Für eine große Konzertreise in den USA musste Rachmaninow allerdings die Arbeit in jenem Herbst und Winter unterbrechen. Erst im Juni 1936 konnte er in die Schweiz zurückkehren und den Schlusssatz komponieren. Die Uraufführung fand im November des gleichen Jahres in Amerika statt. „Ich war bei den ersten zwei Aufführungen anwesend“, schrieb Rachmaninow, „sie wurde wunderbar gespielt (das Philadelphia Orchestra—Stokowski dirigierte). Sowohl das Publikum als auch die Rezensenten reagierten verschnupft. Persönlich bin ich völlig überzeugt, dass es ein gutes Werk ist. Aber … manchmal irrt sich auch der Autor! Ich halte jedoch an meiner Meinung fest.“ (Übersetzung aus dem Englischen, d. Ü.) Rachmaninow hatte recht, was die Qualität der Sinfonie betraf. Die ersten Reaktionen des Publikums lassen sich vielleicht damit erklären, dass die Menschen in den USA noch an der Weltwirtschaftskrise litten und in Europa vor einem Krieg bangten. Die 3. Sinfonie ist das Werk eines sich schwer ins Exil einlebenden Mannes. Sie bewegt sich mit Unbehagen zwischen zwei Welten: zum einen das Russland, das Rachmaninow nach der Revolution verlor, und zum anderen die unsichere neue Welt Westeuropas und den USA zwischen den zwei Weltkriegen, wo der Komponist sein Leben neu aufbauen musste. Die meisten Sinfoniethemen haben einen sehr eindeutig russisch Charakter, werden aber so zweideutig behandelt, dass wenige Sachen ganz das sind, was sie anfänglich scheinen. Man braucht zum Beispiel nur an das so genannte „Mottothema“ denken. Dieses Thema erklingt gleich zu Beginn wie ein einleitender Choral aus drei wechselnden Tönen, die hier in den wässrigen, gequetschten Farben der Klarinette, des gedämpften Horns und hohen Solocellos gekleidet sind. Das Mottothema kehrt im Verlauf der Sinfonie in verschiedenen Formen wieder. Doch erst halbwegs durch den Schlusssatz tritt seine latente Bedeutung zutage. Hier huschen schnell Passagen vorbei (die man leicht verpassen kann), in denen das Motto unverkennbar als eine Variante des gregorianischen Chorals Dies irae in Erscheinmung tritt—eine sich durch die gesamte Musik Rachmaninows ziehende melodische Mahnung, dass alles vergänglich ist. War sich Rachmaninow bewusst, dass die Sinfonischen Tänze sein letztes Werk sein würden? Ungeachtet davon, ob er so eine Vorahnung hatte oder nicht, beendigten wenige Komponisten ihre Laufbahn mit solch passender Musik. Die Sinfonischen Tänze enthalten nämlich das Feinste von Rachmaninow und stellen ein Kompendium lebenslanger musikalischer und emotioneller Erfahrungen dar. Vor der Komposition des Werkes fand eine große öffentliche Retrospektive von Rachmaninows dreifaltiger Karriere als Komponist, Pianist und Dirigent statt. Am 11. August 1939 trat Rachmaninow zum letzten Mal in Europa auf, und kurz danach zog er mit seiner Familie in die USA. Er gehörte zu den zahlreichen vom heraufziehenden Krieg aus Europa fortgetriebenen Künstler. In der darauf folgenden Winterspielzeit gab das Philadelphia Orchestra zur Feier des 30. Jahrestages von Rachmaninows amerikanischem Debüt fünf Konzerte in New York ausschließlich mit Werken des Komponisten (1909 war Rachmaninow in New York als Solist in der von Walter Damrosch dirigierten Uraufführung seines 3. Klavierkonzerts aufgetreten, bei der nächsten Aufführung des Werkes in New York stand Gustav Mahler am Pult). Rachmaninow trat als Pianist und Dirigent in Erscheinung, zu den gespielten Werken gehörten die drei Klavierkonzerte, die Rhapsodie über ein Thema von Paganini, die 2. und 3. Sinfonie, die sinfonische Dichtung Die Toteninsel und die Chorsinfonie Die Glocken. Im Sommer 1941 schrieb Rachmaninow an Eugene Ormandy und bot ihm und dem Philadelphia Orchestra die Uraufführung der drei „Fantastischen Tänze“ an. Als die Orchestrierung zwei Monate später fertig gestellt war, hatte sich der Komponist endgültig für den Titel Sinfonische Tänze entschieden. Das Werk liegt in zwei Fassungen vor: für großes Orchester und für zwei Klaviere. Rachmaninow ließ trotz seiner ausgezeichneten Orchestrierungsfähigkeiten die Bogenführungen und Artikulationen der Streicherstimmen immer von einem professionellen Musiker überprüfen, und in diesem Fall genoss er die Hilfe von keinem Geringeren als dem Violinisten Fritz Kreisler. Rachmaninow scheute sich gewöhnlich, über seine Musik zu sprechen. Deshalb wissen wir sehr wenig über den Kompositionshintergrund der Sinfonischen Tänzen. Uns ist jedoch bekannt, dass andere Werke Rachmaninows von einer visuellen oder literarischen Idee angeregt wurden—Beispiele dafür sind Die Toteninsel und einige Études-tableaux für Klavier solo. Es ist deshalb sehr wahrscheinlich, dass der Komponist auch die Sinfonischen Tänze mit einem poetischen, wenn nicht sogar autobiografischen Inhalt versah. Über den können wir spekulieren, aber er wird niemals enthüllt. Einen Schlüssel liefern womöglich die Titel, die Rachmaninow für jeden Satz vorschlug. Nachdem Michel Fokine ein erfolgreiches Ballett auf die Musik der Rhapsodie über ein Thema von Paganini geschaffen hatte (Royal Opera House, Covent Garden, London 1939), schlug man eine weitere Zusammenarbeit vor. Rachmaninow spielte dem Choreografen die Sinfonischen Tänze vor und erklärte, sie folgten der Gliederung Mittag – Dämmerung – Mitternacht. Der erste Tanz weist eine dreiteilige Form auf, wobei die Außenabschnitte in c-Moll eine langsamere Episode in cis-Moll einschließen. Diese zeichnet sich durch einen außergewöhnlichen und bisweilen sogar exzentrischen Einsatz des Orchesters aus. Nach dem stampfenden Einleitungsteil, in dem das Klavier als ein Orchesterinstrument verwendet wird und die Holzbläser durchdringend schrill rufen, bietet der Mittelteil sanft schlängelnde Holzbläserlinien, auf deren Hintergrund sich eine großartige Rachmaninowmelodie entfaltet, die zuerst einem Altsaxofonsolisten anvertraut wird—ein für Rachmaninows Musik typischer unheimlicher, melancholischer Klang. Gegen Ende dieses ersten Tanzes breitet sich Ruhe in der Musik aus, und bei einem Wechsel von c-Moll nach C-Dur erklingt ein breites neues Thema in den Streichern über einer läutenden Verzierung aus Flöte, Pikkoloflöte, Klavier, Harfe und Glocken. Rachmaninow ging wohl nicht davon aus, dass man das als ein Selbstzitat erkannte. Es handelt sich hier um das Mottothema seiner unglückseligen 1. Sinfonie, die nach ihrer katastrophalen ersten und einzigen Aufführung 1897 zurückgezogen wurde (und deren Partitur angeblich verschwand). Der Misserfolg dieses Werkes hatte dem jungen Komponisten schwer zugesetzt, und er brachte einige Jahre lang danach keine Komposition mehr zustande. Wir werden nie wissen, welche persönliche Bedeutung dieses Zitat jetzt für Rachmaninow am Ende seines Lebens hatte. War es vielleicht ein Exorzismus oder eine Erinnerung an eine frühere Liebesbeziehung, die hinter der Sinfonie stand? Ein böses Knurren der Blechbläser leitet den zweiten Tanz ein. Er ist ein Walzer in der Tradition von Berlioz, Tschaikowski und Mahler, und wie in den Sätzen dieser Komponisten nimmt der Walzer, dieser äußerst gesellschaftsfähige und gesellige Tanz, bisweilen den Charakter eines Danse macabre an. Der Titel „Dämmerung“ passt ausgezeichnet für diese schattenhafte, von Gespenstern der Vergangenheit verfolgte Musik. Die Uraufführung fand am 3. Januar 1942 mit dem Philadelphia Orchestra unter Eugene Ormandy statt. Das Werk wurde gemischt aufgenommen wie schon die 3. Sinfonie fünf Jahr davor. Mal von der kaum relevanten Frage abgesehen, ob die musikalische Sprache zu altmodisch war oder nicht, scheint eine schwer fassbare Qualität des Werkes, eine unbehagliche Ambiguität der Ziele und des Ausdrucks, alle zu jener Zeit verwirrt zu haben. Im Laufe der Zeit begann man allmählich die Sinfonischen Tänze als eine der feinsten Errungenschaften Rachmaninows zu schätzen, wo ein tiefes Gefühl des Rätselhaften im Herzen des Werkes das hohe Maß an Einfallsreichtum und instrumentaler Brillanz nur bereichert. Mili Balakirew wuchs flussabwärts von Moskau in der an der Wolga gelegenen Verwaltungshauptstadt Nischni Nowgorod auf. Der Reiz ging jedoch von St. Petersburg aus. Von musikalischen Ambitionen erfüllt gab der junge Balakirew seine Mathematikstudien auf und begann ein Künstlerleben in Russlands wichtigster Kulturstadt. Balakirews Entscheidung fand bald Bestätigung. Der junge Komponist machte sich in den Künstlerkreisen der Stadt einen Namen und schloss sich schließlich der Gruppe der Fünf an. Zu ihr gehörten neben Balakirew auch Alexander Borodin, César Cui, Modest Mussorgski und Nikolai Rimski-Korsakow. Diese jungen Musiker opponierten sich gegen das bürgerliche Musiketablissement und sprachen sich für den unverdorbenen kreativen Geist eines Autodidakten und den natürlichen Reichtum der umfangreichen russischen Volkskultur aus. Aufgrund seiner Erfahrung übernahm Balakirew die inoffizielle Rolle eines Mentors für die Gruppe, entwickelte sich jedoch zu einer autoritären Person. Er lehnte unvermittelt alle musikalischen Meinungen ab, die sich von seinen eigenen unterschieden, was dazu führte, dass die Musik aller fünf Komponisten zunehmend ähnlich und immer mehr nach Balakirew klang. Diese Unsicherheiten Balakirews, die durch eine zu starken Depressionsschüben neigenden Persönlichkeit verstärkt wurden, führten 1871 zu einem Nervenzusammenbruch. Balakirew wandte sich da von allen Aspekten seines Musiklebens ab und versuchte, Trost in der russisch-orthodoxen Kirche zu finden. Er trat auch von seiner Leitungsposition an der Musikalischen Freischule in St. Petersburg zurück und fand eine bequeme Anstellung als Eisenbahnbeamter außerhalb der Stadt. Zu diesem Zeitpunkt hatte er völlig mit dem Komponieren aufgehört. Fünf Jahre später kehrte er wieder zurück und nahm erneut seine Arbeit als Direktor auf. Er begann auch wieder, Musik zu komponieren. Stilistisch ähnelte sie den Werken aus seinen jüngeren Jahren, war aber leider nicht von der gleichen Leidenschaft erfüllt. Balakirew trat 1895 in den Ruhestand und widmete seine verbleibenden Jahre dem Komponieren. Balakirew besuchte den Kaukasus zum ersten Mal 1862 und war von den dramatischen Landschaften, den Menschen und ihrer Musik begeistert. Ein Resultat dieses Besuchs war Islamej, die verteufelt schwierige „orientalische Fantasie“ für Klavier, die Balakirew im Herbst 1869 komponierte. Dann kam die sinfonische Dichtung Tamara, die allerdings erst 1882 abgeschlossen wurde. Viele betrachten Tamara als das Hauptwerk des Komponisten. Der orientalische Stil, der von Glinka in seiner Oper Ruslan und Ljudmila erstmals vorgestellt und dann von Balakirew und seinen Anhängern auf eine neue Stufe gehoben wurde, zeichnete sich durch zwei Eigenschaften aus: eine zähe langsame Melodie, die häufig stark verziert war und übermäßige Intervalle enthielt, sowie schnelle Tanzrhythmen mit reichlich Wiederholung, die oft mit viel Schlagzeug begleitet wurden. In Tamara sind diese Eigenschaften zur Wiedergabe der Atmosphäre und des Gedichtverlaufs von wesentlicher Bedeutung. Der Beginn ist Tonmalerei zur Darstellung der Flussschlucht. Hieraus schält sich in den aufsteigenden Holzbläsern allmählich das erste „Tamarathema“ heraus. Es herrscht ein Gefühl zunehmender Tragik, wenn weitere Themen der Erzählung mehr Details und Farbe hinzufügen. Die Synkopen und rhythmischen Verschiebungen, der schiere, ja fast schon hysterische Taumel mancher Passagen sind gleichermaßen beunruhigend wie aufregend.